(PhysOrg.com) -- A team of researchers led by University of Kentucky College of Agriculture Professor Joe Chappell is making a connection from prehistoric times to the present that could result in being able to genetically create a replacement for oil and coal shale deposits. This could have fundamental implications for the future of the earths energy supply. Tom Niehaus, completing his doctorate in the Chappell laboratory; Shigeru Okada, a sabbatical professor from the aquatic biosciences department at the University of Tokyo; Tim Devarenne, a UK graduate and now professor of biochemistry and biophysics at Texas A&M University; and UK colleagues, Chappell, David Watt, professor of cellular and molecular biochemistry (College of Medicine) and his post-doctoral associate Vitaliy Sviripa had an important paper published today in the Proceedings of the National Academy of Sciences (PNAS). Their research findings go well beyond the basic science dealing with the origins of oil and coal. While scientists previously established that oil and coal have their roots in the organisms that lived on the planet over 500 million years ago, researchers only are sure of one organism that directly contributed to these natural resources. 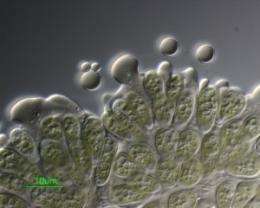 That organism is the algae Botryococcus braunii which left behind its chemical fingerprints  an oil that over geological time has turned into oil and coal shale deposits. Even more exciting is that this unique algae, B. braunii, still exists today and has been the target of studies from the large chemical and petrochemical industries, said Chappell. End to cheap coal closer than we thought? yeah good idea, make even more oil as if this world won't be toxic enough once we've burned off what we already have. There are better alternative sources of energy than this. Does this synthetic biofuel produce the same harmful emissions as oil? There are GM organisms that can produce nearly pour in your vehicle ready bio-diesel fuel right now, why would we want to use organisms that are slow? Oh, and stealthc, you fundamentally fail to understand what the danger of fossil fuels are. If you are worried about AGW, fossil fuels represent adding CO2 into the carbon cycle above ground. However if the fuel is "grown" above ground, you are soaking up CO2 from the carbon cycle and re-releasing it when it is burned, hence it then becomes carbon neutral. Also, fossil fuels come with a whole host of toxins, like sulfur, cyanide, dioxins, cadmium, mercury, lead, and quantities of radioactive materials like uranium and thorium. Bio-fuel crops and algae hydroponics produce bio-diesel that has none of those toxins.